Walk down the aisle on graduation day with purple graduation stole draped over your gown to indicate your accomplishments. Purple is a timeless symbol of wisdom, ceremony, and dignity--perfect to celebrate your achievements in academics. We also have a lavender stole that symbolizes elegance. Another particularly significant meaning is that of transformation. It is powerful to consider that as you take part during graduation day in celebrating how you have transformed in your knowledge and learning, you can embody transformation in symbolic color as well. Purple graduation honor stoles, or sashes, may be presented to students for a variety of reasons. Some schools may have students wear it with a cord to indicate higher honors, such as within grade point average or by achieving in a top percentage of the graduating class. Purple graduation honor stoles may also be worn for to show leadership or participation in special academic clubs. Meanwhile, for degrees, purple represents honors in law or jurisprudence. Other times still, instead of giving stoles for particular academia, schools may opt to present all students with a "stole of gratitude," in which they wear throughout the ceremony, and then give to a mentor who contributed to their ability to walk down the graduation aisle that day. Whatever the reason may be, the addition of a purple graduation honor stole will add to the meaningfulness of your ceremony. However it is worn, you can feel at ease when you order with Honors Graduation. 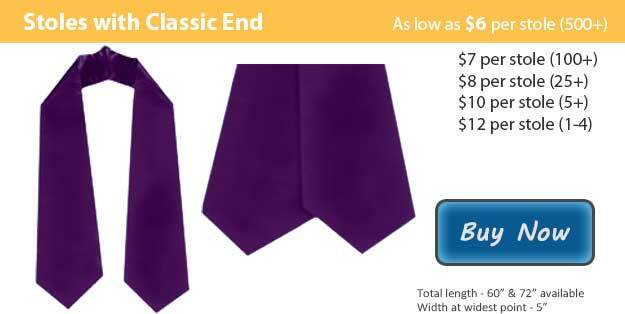 Made of highest quality crepe back satin, you can be assured that your purple graduation stole will be of the highest priority at the most reasonable price. Place your order for your purple graduation honor stole today to prepare for an unforgettable day of ceremony and academic achievement. Remember to ask about our amazing bulk order discounts!